What is your responsibility to your internal moral compass, and how does that responsibility change when your compass points a different direction than your national leadership? This is a question that many of us face today: We have compass that teach us compassion for others, to be reasonable stewards of the world, to strive for equity and equality and even tempers. We have respect for the rule of law, and withhold judgement until we have the facts. We respect others, be they different sexes, genders, colors, abilities. But we are faced with an administration that seems to abandon those values — in fact, it thumbs its nose at what many of us respect, taking actions that appear to serve only the self interest of the ruling family and the oligarchs. Our elected officials? They seem to have no moral compass, worrying only about their own political lives and careers, and seeming to do or say only that which keeps them in office and in favor of the current administration. But this is nothing new. Back in the era of the Showtime show The Tudors, there was a similar situation with King Henry VIII. He had tired of his wife, and wanted another woman. The only thing standing in his way was the Catholic Church, church canon, and church law. So he pressured his Bishops to find a way for him to divorce his wife, and when he couldn’t, he fired them and brought in new leadership. He bullied his administration to create a new church where he would be the supreme leader, and demanded an oath of sovereignty from all accepting that his way was the right and divine way. If you wouldn’t agree, it was the towers, torture, and beheading in your future. But one man thought he had figured out a way to beat the system. He disagreed with the King — his moral and religious principals told him that the King did not have this authority. But he was a lawyer, and so he didn’t speak his beliefs. He stayed silent and attempted to work tightly within the law. Even when the Oath was being enforced, he stayed silent on what he thought was wrong — because silence signaled neither assent or dissent. But when the King wants an answer, silence is taken as resistance. As he would not speak up for the King, he must be against the King. And so, in the end, his head rolled like many others. He was a martyr for his silence. 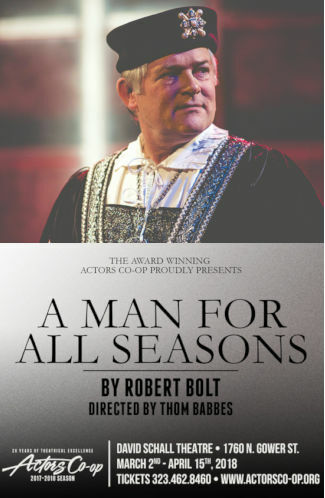 He was Sir Thomas More, and he was the subject of the play just finishing its run at the Actors Co-op (FB) in Hollywood, A Man for All Seasons by Robert Bolt (which we saw last night). It was a story with which I had been familiar, being addicted to The Tudors when it was on (plus going to Ren Faire). More was a man with strong and unwavering moral conditions, but who did not speak up or act (other than to resign) . The situation of More had lots of parallels with the situation this nation is facing with Donald Trump. The production was also an interesting juxtaposition of play and the mission of Actors Co-Op. Being Jewish, I’m always a bit troubled by the religious aspect of this theatre group, whose mission states they are a company of Christian actors driven by passion for the Lord Jesus Christ. I’m always worried a bit about proselytizing or particular themes in productions. However, the quality of the productions wins me over. I felt their mission a bit more with this show — in particular, I felt them not being silent through it. For as much as the evangelicals back Trump, the President’s actions and behavior are decidedly non-Christian. They show none of the compassion shown by Jesus towards the poor and the stranger; they have none of the social justice component of Christ’s ministry (and none of the social justice of the Old Testament and Jewish beliefs). This belief is social justice is shown in the ministry of Actor’s Co-Op sponsoring organization, the First Presbyterian Church of Hollywood. I believe that, through this show, Actors Co-Op wasn’t being silent: they were saying that Trump’s values are not Christian values, and that people attempting to claim they are do so to preserve their power and position, not to make the world a better place. I applaud Actors Co-Op for this reminder. Sir Thomas More went to the gallows for being silent and not speaking up. Had a person of More’s moral conviction and standing spoken up sooner, might things have changed. Challenging authority with the truth is dangerous, but vital if change is to occur and the world is to become a better place. This production made you think about the need to speak up and the need to stand for what is right, even in the face of personal danger. If you can, speak; if you can’t, let your silence be a thorn in the side of authority. Don’t let misguided authorities go easy into the good night. Director Thom Babbes brought out strong performances from his acting ensemble, drawing you in and keeping your focus on the story. This is a dark story with an ending that isn’t happy, but he found a way to bring in just enough humor and bathos to not let the darkness overwhelm. The actors were believable when necessary, but there was enough in the staging to remind you that this was a play, and that what you were seeing wasn’t real life. This, in turn, made our real life situation even scarier, as the parallels became clearer. In the lead position was Bruce Ladd as Sir Thomas More. Ladd gave an outstanding performance: strong and yet personable, forceful and believable, yet with warmth underneath. It was just riveting. Also strong was Co-Op regular Deborah Marlowe, who portrayed “The Common Man”. This was a role the brought together all the minor characters from stewards to boatmen to innkeepers to jurors to jailors, and also served as the narrator and framing device for the story. As such, Marlowe got to portray numerous different characters and personalities, and she did so with aplomb and skill, and was just a joy to watch. More’s family was portrayed by Treva Tegtmeier as his wife, Lady Alice More; Elsa Gay as his daughter, Lady Margaret More, and Issac Jay as his eventual son-in-law, William Roper. All gave great performances, I particularly liked the flashes of character from Gay. In the circle of acquaintances and friends of More — at least initially — were Sean McHugh as The Duke of Norfolk and Michell Lam Hau as Master Richard Rich. McHugh’s Duke came off as a gregarious sort who was truly friends with More, and did what he could to save him from his fate — but ultimately, failed. Hau’s Rich was more of an opportunist: he was there to get the better job and the better pay, and didn’t let philosophies trouble him. This explains why this character came off as the Toady he was, especially with respect to Cromwell. The mention of Cromwell brings us to what I would call the King’s circle: John Allee as Thomas Cromwell; Greg Martin as Cardinal Thomas Wolsey and Archbishop Thomas Cranmer; Vito Viscuso as Signor Chapuys, the Spanish Ambassador; and Ian Michaels as King Henry VIII. Allee gave a chilling portrayal of a determined Cromwell, and Viscuso was a warm and welcoming Chapuys. Viscuso and Michaels really only had a few scenes, but were good in them. Turning to the production side of things: Rich Rose‘s Scenic Design was simple but effective: a space with a generic square background; some boxes on stage from which props could be extracted, some stairs, and tables. But with the imagination, it worked well. This was augmented by Shon Leblanc‘s costumes, which seemed appropriately period for the caste and time. Lisa D. Katz‘s lights served to augment the mood, and Juan Sanson‘s sound design provided the appropriate sound effects. Other production credits: Eric White – Stage Manager; Thomas Zabilski – Asst Stage Manager; Selah Victor – Production Manager; and Carly Lopez – Producer. Due to a change in the schedule, our “early bird” tickets for A Man for All Seasons turned into tickets for the penultimate performance; the final performance is occurring as I write this. The next production at Actors Co-op (FB) is Violet, running May 11-June 17, 2018. Ob. Disclaimer: I am not a trained theatre (or music) critic; I am, however, a regular theatre and music audience member. I’ve been attending live theatre and concerts in Los Angeles since 1972; I’ve been writing up my thoughts on theatre (and the shows I see) since 2004. I do not have theatre training (I’m a computer security specialist), but have learned a lot about theatre over my many years of attending theatre and talking to talented professionals. I pay for all my tickets unless otherwise noted. I am not compensated by anyone for doing these writeups in any way, shape, or form. I currently subscribe at 5 Star Theatricals (FB) [the company formerly known as Cabrillo Music Theatre (FB)], the Hollywood Pantages (FB), Actors Co-op (FB), the Chromolume Theatre (FB) in the West Adams district, a mini-subscription at the Saroya [the venue formerly known as the Valley Performing Arts Center (VPAC)] (FB), and the Ahmanson Theatre (FB). Through my theatre attendance I have made friends with cast, crew, and producers, but I do strive to not let those relationships color my writing (with one exception: when writing up children’s production, I focus on the positive — one gains nothing except bad karma by raking a child over the coals). I believe in telling you about the shows I see to help you form your opinion; it is up to you to determine the weight you give my writeups. The third weekend of April brings Bad Jews at The Odyssey Theatre Ensemble (FB) on Friday, followed by The Hunchback of Notre Dame at 5 Star Theatricals (FB) (nee Cabrillo Music Theatre (FB)) on Saturday. The last weekend of April sees us travelling for a show, as we drive up to San Jose to see friends as well as Adrift in Macao at The Tabard Theatre Company (FB).